The word Buddha means The Awakened One, coming from the Sanskrit root budh – 'to wake'. He is a man who has woken fully, as if from a deep sleep, to discover that suffering, like a dream, is over. The historical Buddha was however a man like any other, but an exceptional one; what he rediscovered was a way that anyone can walk, providing that they are so inclined. 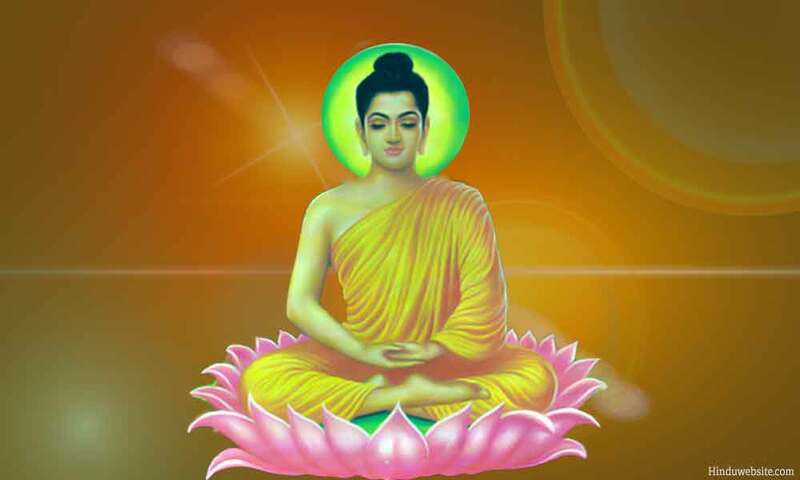 The historical Buddha Gautama was not the first Buddha. There had been others who had walked the way before him. He was not a god, a prophet or any kind of supernatural being. He was, as we have seen, one who was born, lived and died a human being. A remarkable human being, who discovered a way of achieving true wisdom, compassion and freedom from suffering. He 'rediscovered an ancient way to an ancient city' that had been covered up and forgotten. Through his own efforts he was able to find the way out of suffering to liberation, and those that have followed him have kept that way open. The first, Change, points out the basic fact that nothing in the world is fixed or permanent. We ourselves are not the same people, either physically, emotionally or mentally, that we were ten years - or even ten minutes ago! Living as we do, then, as shifting beings upon shifting sands, it is not possible for us to find lasting security. Buddhists do not believe that there is anything everlasting or unchangeable in human beings, no soul or self in which a stable sense of 'I' might anchor itself. The whole idea of 'I' is in fact a basically false one that tries to set itself up in an unstable and temporary collection of elements. Take the traditional analogy of a cart. A cart may be broken down into its basic components -axle, wheels, shafts, sides, etc. Then the cart is no more; all we have is a pile of components. In the same way 'I' am made up of various elements or aggregates (khandhas): form (rupa-khandha), feeling-sensation (pleasant, unpleasant, neutral), (vedana-khandha), perception (sanna-khandha), volitional mental activities (sankhara-khandha), sense consciousness (vinnana-khandha). Buddhism begins with the fact of suffering. However, before we can do anything about it, we must know its cause, which is the deeply-rooted sense of 'I' that we all have. Because of this we are always struggling to get things that are pleasurable and avoid things that are painful to find ease and security, and generally to manipulate people and situations to be the way 'I' want them. And because the rest of the world does not necessarily fit in with what I want, we often find ourselves cutting against the general flow of things, and getting hurt and disappointed in the process. Suffering may be therefore brought to an end by transcending this strong sense of 'I' so that we come into greater harmony with things in general. The means of doing this is The Noble Eightfold Path. (1) Right View. (2) Right Thought. (3) Right Speech. (4) Right Action. (5) Right Livelihood. (6) Right Effort (7) Right Mindfulness. ( Right Concentration. The Wheel is the symbol of the Dharma and is shown with eight spokes which represent the Noble Eightfold Path. Right View is important at the start because if we cannot see the truth of the Four Noble Truths then we can't make any sort of beginning. Right Thought follows naturally from this. 'Right' here means in accordance with the facts: with the way things are - which may be different from how I would like them to be. Right Thought, Right Speech, Right Action and Right Livelihood involve moral restraint refraining from lying, stealing, committing violent acts, and earning one's living in a way harmful to others. Moral restraint not only helps bring about general social harmony but also helps us control and diminish the sense of 'I'. Like a greedy child, 'I' grows big and unruly the more we let it have its own way. Next, Right Effort is important because 'I' thrives on idleness and wrong effort; some of the greatest criminals are the most energetic people, so effort must be appropriate to the diminution of I, and in any case if we are not prepared to exert ourselves we cannot hope to achieve anything at all in either the spiritual sense nor in life. The last two steps of the Path, Right Mindfulness or awareness and Right Concentration or absorption, represent the first stage toward liberation from suffering. To be aware and at one with what we are doing is fundamental to proper living, this practice takes many forms but in the West the formal practice is called meditation. In the most basic form of Buddhist meditation, a person sits cross-legged on a cushion on the floor or upright in a chair. He/she quietly watches the rise and fall of the breath. If thoughts, emotions or impulses arise, he/she just observes them come up and go like clouds in a blue sky, without rejecting them on the one hand or being carried away into daydreaming or restlessness on the other. It should be learnt under the guidance of a teacher just as the Buddha too learnt meditation. 'Your house is on fire, burns with the Three Fires; there is no dwelling in it' - thus spoke the Buddha in his great Fire Sermon. The house he speaks of here is the human body; the three fires that burn it are (1) Desire/Thirst, (2) Anger and (3) Delusion. They are all kinds of energy and are called 'fires' because, untamed, they can rage through us and hurt us and other people too! Properly calmed through spiritual training, however, they can be transformed into the genuine warmth of real humanity.